Learn more about the Lorex 1080p HD Security Camera System with Flir Secure Connectivity. Find pricing, and answers to common questions. 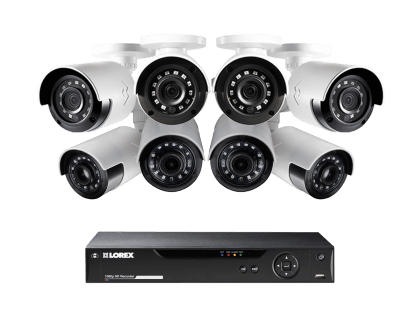 The Lorex 1080p HD Security Camera System with Flir Secure Connectivity comes with an eight-channel DVR, and eight bullet security cameras with 1080p HD resolution, which include four wide-angle cameras. This Lorex business security system does not need professional installation. 8 cameras including 4 wide angle cameras. 160° viewing for large area monitoring. HD DVR supports up to 8 cameras. Pros: Cabling and wide-angle cameras are vandal-proof. Features RapidRecap that compiles hours of footage into a short video summary. Cons: Web UI not that easy to navigate. Bottomline: Complete security system that is suitable for monitoring large areas such as warehouses. What are some alternatives to the Lorex 1080p HD Security Camera System with Flir Secure Connectivity? Where can I buy the Lorex 1080p HD Security Camera System with Flir Secure Connectivity? The Lorex 1080p HD Security Camera System with Flir Secure Connectivity is available via Amazon and the Lorex website. Does the Lorex 1080p HD Security Camera System with Flir Secure Connectivity work at night? Yes. It features cameras with infrared (IR) LEDs that perform optimally in the dark. This system enables you to see up to 130 ft. in regular nighttime conditions, and up to 90 ft. in total darkness. It switches on and off between day and night to provide accurate color reproduction during the day, and crisp footage at night. Can the Lorex 1080p HD Security Camera System with Flir Secure Connectivity be used in any weather? The Lorex 1080p HD Security Camera System with Flir Secure Connectivity comes with IP66-rated cameras that are unaffected by inclement weather. This system's cameras are designed for North American weather conditions, and can operate in extreme temperatures from -22 °F to 140 °F.